What is amazing about quality period pieces is the ability to draw parallels between that particular time and the present. To use the past or the future as a window into the current makes everything feel a bit more real. 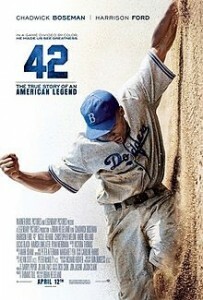 The Jackie Robinson biopic “42” does exactly that. “42” is a fine sports movie although it is nothing special. I left the theatre entertained and enlightened in certain aspects of Robinson’s journey, but this movie will be up for no awards. 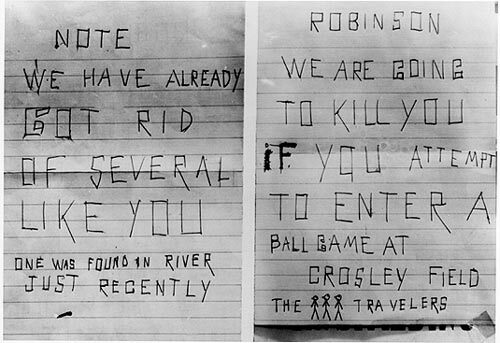 What the film did do well is highlight the brutality Robinson was met with on a daily basis. The seething opposition aimed at one man was truly horrendous, but accurate. Overall, the film is a poignant examination of intolerance, ignorance and cruelty among the masses. Breaking barriers is an immense challenge. 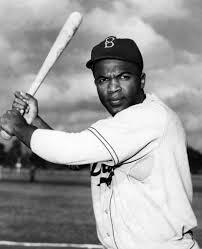 While I am extremely proud and thankful that Jackie Robinson had the emotional and mental fortitude to accomplish such a change, the work is not over. Today, we face a new barrier. There is not a single openly gay active athlete in America’s four major sports (NBA, NHL, MLB, NFL). Players have come out but only after retiring. Is our sports culture so single minded that closeted gay athletes are afraid to come out? Will they be met with the same vitriol that Robinson was once forced to endure? Of course, there are some examples of courageous honesty that are met with nothing but support. Brittney Griner, the likely number one overall pick in the WNBA draft, recently confirmed the rumors of her sexual orientation. “Be who you are” Griner said in her statement. 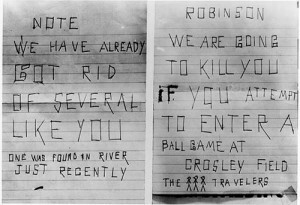 All Robinson wanted to be was a ballplayer but for the longest time the public wouldn’t let him, only because he was a littler different than them. Change is a slow process. It takes years to gain full acceptance in some instances. We can only hope that society has changed enough that a gay athletes would even be a blip on the radar anymore. Former Baltimore Ravens linebacker, Brendon Ayanbadejo, has expressed his staunch support for gay marriage and worked hard to spread acceptance throughout the NFL. 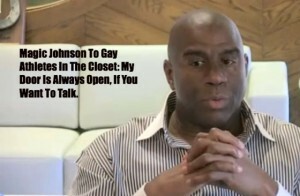 In fact, Ayanbadejo says that they are in talks with up to four current players about coming out publicly. This would forever shift the landscape for gay athletes and truly test the sports culture’s readiness for such a change. But, what would be the reaction both in and outside of the locker room? Let us hope that unlike in Robinson’s era, we do not see everything in black and white. Instead, let us hope for a little rainbow-color in there.